Mr Peter Bowring was born on 22 April 1923 and was married to Carole. He was Chairman of C.T.Bowring & Co (and became Vice-Chairman of Marsh & McLennan Companies Inc when that company took over his. He joined the World Traders’ Company on 1 October 1985 having been a founding member of the Guild. 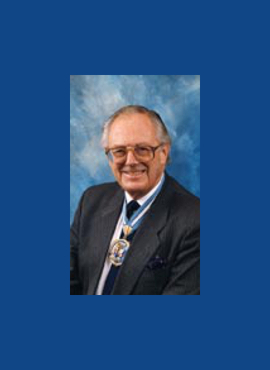 He was clothed as a liveryman on 16 March 2000, having received the Freedom of the Company on 16 December 1993, and the Freedom of the City of London on 15 May 1979. He was also a Freeman of The Company of Watermen and Lightermen. Peter passed away 1 December 2013.